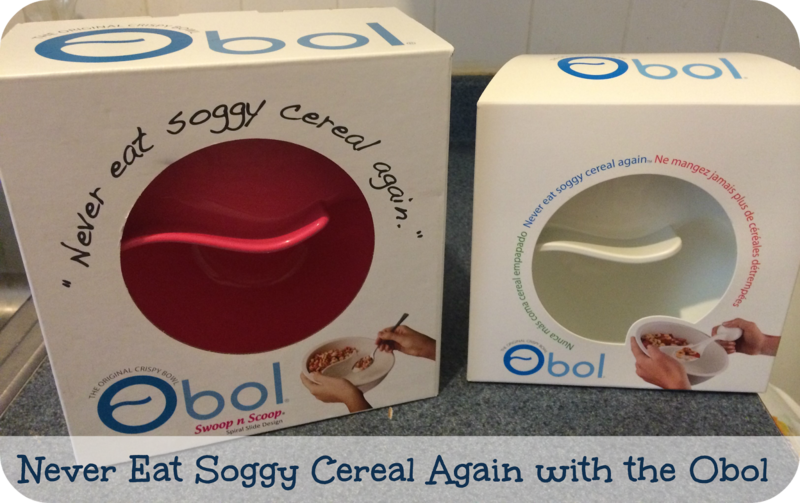 Never Eat Soggy Cereal Again with the Obol + Giveaway! I received two complimentary Obol's to review. However the opinions are 100% my own. "The Original Crispy Bowl" is patented and made in the USA by Obol. The Obol is the best way to eat cereal so that it stays crisp! I have always eaten cereal quickly to get as much crispness from the cereal that I can get. My husband hates soggy cereal so much that he takes a bowl of cereal and brings the container of milk with him to the table. He then adds the milk as he eats the cereal to prevent any sogginess. When I got the chance to try the Obol my husband was more excited than I was! All you have to do is add the cereal to the top part and the milk to the bowl part. Then you "Swoop n Scoop"®. He used it strictly for cereal but I used it for my hummus & carrots and berries & yogurt. It was the perfect size to proportion my snacks too. The Obol also has a handle underneath and comes in 7 great colors and 2 different sizes. To find out more about the Obol check out their site: www.obol.co. Use code obol25 at checkout to get 25% off! Three lucky USA winners will win their own Obol in color and size of choice. Enter in the rafflecopter below. First Time Mom and Losing It is not responsible for fulfillment of prize. This is a great idea! I wish I had thought of it. Someone is going to be rich off of this bowl! OMG!!! Is This Cool Or What Amazing Idea Thanks Fpr The Great Giveaway! These are too cool! If I were a chosen to be a lucky winner, I would choose the Big Obol in blue. Cool idea! I've never heard of these bowls before, my kids would dig them! Neat idea. My kids could use that, although I don't think I eat cereal slow enough for it to get soggy. Very cool! I would buy the smaller size Obol in purple! It wouldn't get soggy if you eat it fast enough.. it's only soggy if you're slow or let it sit there.. so I don't understand this product.. I love this! I can't stand soggy cereal and don't eat alot of it just because of this! I need this bowl! That's really cool. I don't mind soggy cereal- I actually prefer it but that's really cool! Just a simple modification and you can just add milk to the portion you'll bite for that crisp feel for cereals. I have always done the same thing with cereal by eating it quick for the crispy crunch. Thanks for the information. I would love the large bowl in green, the blue color is also very nice. I have seen this before . I always wondered if it worked. Thanks! I love this idea.. my kids would love this. I must say it's a cute product and very efficient too. I love it when a simple things like a plate for cereals evolve. How cool is this! The things that are popping up these days. There are some cereals that I really just like barely touched with milk, so this is perfect. Some I like smooshy like raisin bran but golden grahams...I need that crisp and nearly dry! This is definitely a must have. I'm not big in cereals because I can't stand it when they get soggy. Wow ! this is such an amazing bowl. My niece and nephew are going to love it for sure. Wow, this certainly is new! I would pick the pink BIG OBOL my granddaughter will love this.